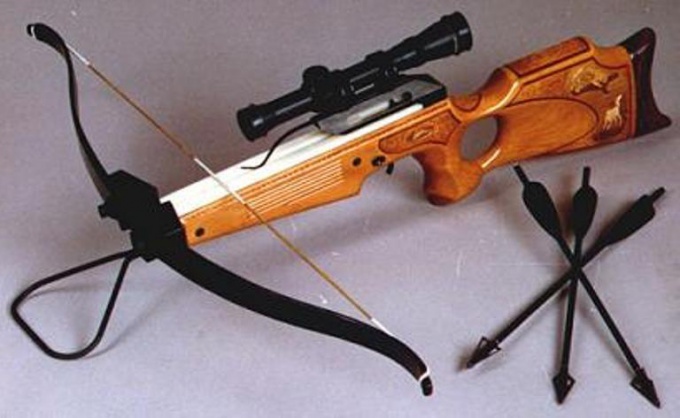 The crossbow is a missile weapon in which the projectile is used arrow. Invented crossbow was many centuries ago. Since then his form has changed, weapons have become more modern. However, the principle of operation and design of the crossbow remained the same. The most important subsystem is the crossbow trigger mechanism. From its simplicity and reliability depends on the quality of the shooting. The trigger mechanism of the crossbow is very simple, which is key to the reliability of the device. The purpose of the trigger mechanismand to make the descent of the string smooth and easy. Bed crossbow sawed into two pieces to place between the parts of the trigger mechanism. Of steel or brass cut out two plates. Plates should be uniform in size. Form of does not really matter, as long as they fulfilled their function. Fabricate the drum. It will keep the bowstring, and the drum is held by the ledge of the trigger. When you press the trigger the drum is released from the barrier and begins to rotate. The string comes off the drum, the arrow goes into the target. After you fire a shot, pull the string back to its original place, the drum engages the lug for the string and is rotated to its original position. Triggered spring-loaded trigger, he gets into the groove of the drum. Now the drum is rigidly fixed and does not rotate. The string is put on the tabs drums, crossbow ready for another shot.